Learn about the "museum like no other" and plan your visit today! Learn about the three key components of the NCM’s mission and how the Museum is becoming even more relevant and needed in today’s information age. From a motel and restaurant to one of the most unique museums in the United States, the NCM has a very interesting history. Follow the timeline and learn about the pioneers with the vision to help the Museum become what it is today. The NCM’s exhibits cover a wide range of subjects and time periods. From the Revolutionary to the Cold War, as well as special exhibits such as the Native American Code Talkers and the John Nash Letters. Plus check out a variety of museum-related videos. Learn how to get the most out of your visit to the National Cryptologic Museum. And remember, admission is always FREE! The NCMF supports the NCM by acquiring exciting, valued, and often very rare artifacts. The NCMF and the National Security Agency (NSA) established a private-public partnership to create the Cyber Center for Education & Innovation (CCEI) - Home of the National Cryptologic Museum (NCM) facility at Fort Meade, Maryland. Click to learn about this unique educational complex that will also serve as the NCM's home. What is cryptology? Get acquainted with our favorite subject. Doing some research? 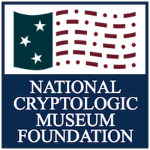 The National Cryptologic Museum Library holds a unique collection and archives of unclassified and declassified books, documents, and memorabilia focusing on cryptology and cryptologic history. Explore the vision for the new Cyber Center for Education and Innovation (CCEI) - Home of the National Cryptologic Museum.